The mission of this subcommittee is to strengthen the families within our parish community acknowledging that parents are the primary teachers of their children and the ones though whom the faith is most critically communicated. 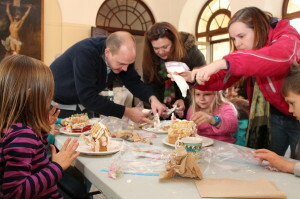 St. Vincent de Paul families build gingerbread houses together at the 2013 Shrine of St. Anthony Fall Fest. These are commonly heard complaints by kids throughout the world on Sunday morning resisting Mass. As parents, we recall our own experiences at this age and just settle for that these are age-appropriate feelings and our children will eventually learn to appreciate being Catholic… someday. 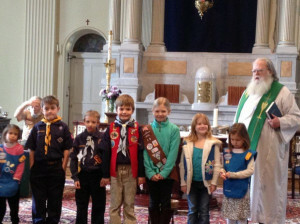 Scout Sunday celebrated at St. Vincent de Paul. Waiting for “someday” is a big risk. How can we expect to engender a lifetime of devotion to Jesus (and service for Him) if we waste the first 18 years of their life boring them with church? At St. Vincent de Paul, we believe our children deserve better. Their right and our obligation is to ensure they learn and know that Jesus and the Catholic Church are a powerful, dynamic and charismatic force that creates real and meaningful good in our families, our neighborhoods, and in our world. To that end, our parent-coordinated Family Life committee is charged with creating opportunities for St. Vincent de Paul families, and their children of all ages, that will foster an excitement for Jesus, our core faith principles and Catholic traditions. 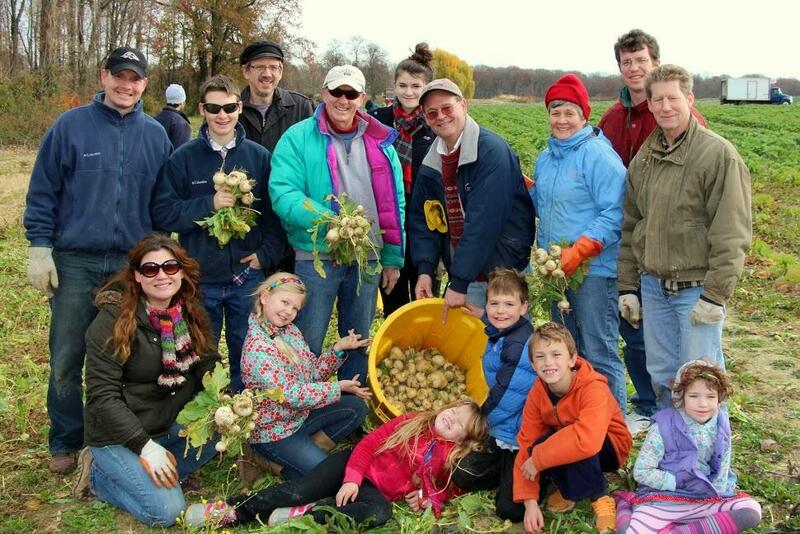 St. V families “glean” produce from Zahradka Farm to share with area food programs. This programming includes social events, enrichment programs and service projects that explore the spiritual development of our children and weave bonds of faith and friendship among families. 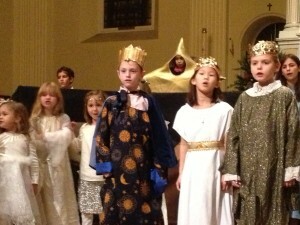 On Christmas Eve, all of St. V’s children participate in re-enacting the Gospel. These events are intended to build and normalize faith experiences for families outside of Mass. 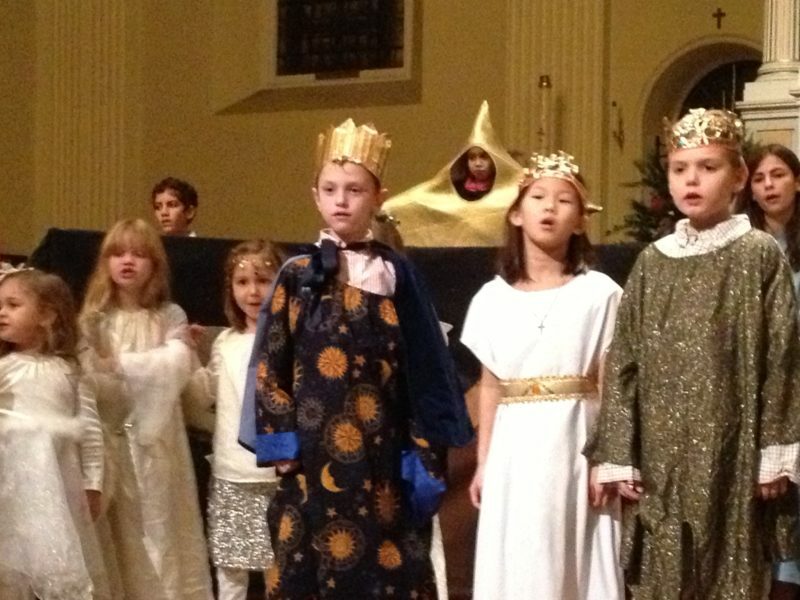 And this is all in addition to our Religious Education programming such as Faith, Fun & Fellowship (CCD), Vacation Bible School, Godly Play and Liturgy of the Word for Kids. Help us enhance the spiritual dimension of family life as a ‘home church’ by joining us for an event or adding your own idea. With the collective support of St. Vincent de Paul, we know we can engage our children and ignite their faith so that they look forward to Sunday mornings and leaving the house for Mass.